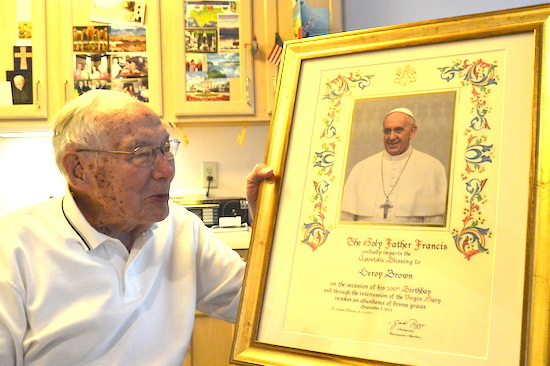 Even though it happened 71 years ago, LeRoy Brown remembers every bit of the story of religious prejudice that brought him to Minnesota and a career both in teaching at a Catholic school and in changing systems that treat Catholics unfairly. Sitting at the kitchen-counter desk in his apartment at an assisted living home in Eagan just weeks away from his 102nd birthday on Sept. 7, Brown told how in 1944 he had been teaching at a public high school in Baraboo, Wisconsin, when the superintendent of schools there threatened not to renew his teaching contract if he and his wife, Dorothy, were going to send their 6-year-old daughter, Margaret, to a Catholic school. “That didn’t sound legal to me,” Brown said, but the challenge that he recalled thinking was, “How strong a Catholic are you?” he said. That was when the phone rang, and Father Vincent J. Flynn, recently appointed president of the then-St. Thomas Military Academy, invited him to come to St. Paul to check out the school because they were looking for a physics teacher. “I’d never heard of St. Thomas,” Brown said, “but when I asked Father Flynn what else I would have to teach, he said nothing — just physics. From being out of a job because of his intention to practice his religion, Brown went on to a 20-year career at St. Thomas Academy, where he became known as “Prof Brown” to generations of students. Decades later, Prof Brown doesn’t hesitate when asked what was the most satisfying part of teaching at the academy. “Kids,” he replied with a big smile. The only splash in the still water of this pool was that when St. Thomas Academy was looking for a swimming coach, Father Flynn turned to the man who during his summers in Baraboo had been manager of the municipal swimming pool. Brown went on to serve for 14 years as St. Thomas’ head swim coach, and now can laugh about how when the academy won a meet, half the swim team would throw him into the pool and the other half would save him from drowning. Back in 1948 the Minnesota High School Association admitted only public school teams to its annual state tournaments. Under the auspices of the Minnesota Catholic Education Association, in 1948 he organized the first state Catholic high school basketball tournament. That led to state Catholic competitions in hockey, debate, speech, music, all organized by letters and phone calls from the physics prof at St. Thomas Academy through the MCEA, which he began to work for full-time in 1963. Brown’s organizing ability caught the attention of one John R. Roach at a unique confluence of world and Church history. The space race was in full bloom between the Soviet Union and the United States, and the Second Vatican Council (1961-65) opened the Church to collaborative decision-making at local levels. In part as a response to fears that the Soviet Union was progressing in space faster than the U.S., Congress passed the Elementary and Secondary Education Act of 1965, which subsidized funding in math and science for all students — not just those in public schools. In the Church, the concept of episcopal conferences was promulgated by Pope Paul VI. American bishops created the U.S. Catholic Conference, and each state began to establish its own state Catholic conference to be a voice in public policy decisions. Minnesota was among the first to do so, and then-Father Roach, who taught at and then was headmaster of St. Thomas Military Academy before founding St. John Vianney College Seminary and becoming the archbishop of St. Paul and Minneapolis, approached Brown to head up the education department of the new Minnesota Catholic Conference in 1967. Brown turned to a former student to teach him the ropes at the State Capitol. Brown organized statewide lobby efforts to persuade the Legislature to require school districts to bus all Minnesota students to school, not just public school students. But that’s getting a bit ahead of the story. “It was not so much me, but [having organized the state Catholic tournaments] I had a pipeline to every Catholic high school in the state,” Brown said. Because Vatican II had promoted ecumenism — cooperation with people of other faith traditions — he joined with Imogene Treichel (“a good Lutheran woman,” Brown said) to create an organization that wasn’t solely Catholic: Citizens for Educational Freedom. CEF went to work, gaining first busing for students of nonpublic schools. “When we got that, we got the gate open,” Brown said. Through the years lobbying efforts gained a fair share of federal dollars for education in math and science for students in nonpublic schools, textbooks, educational services such as speech therapy, tax credits and tax deductions for parents who send their children to nonpublic schools, and full membership in the Minnesota State High School League for nonpublic schools. Although separation of church and state was initially used as an argument for funding to go only to public schools, Brown said he knew that the federal ESEA did not distinguish between school affiliations, and so did the attorney for the state Department of Education at the time. “He was a former student of mine, too,” Brown said, smiling once again. Getting laws changed isn’t easy, Brown admitted. “When you get into the nitty-gritty talking with legislators,” he said, “you’ve got to help them understand the basic unfairness [of current law or public policy]. His 1936 education degree from the University of Wisconsin at River Falls didn’t prepare Brown for a life such as he had, but as he said several times, “Things just happen. A long-time member of St. Mark in St. Paul, Brown continues to volunteer at St. Peter in Mendota, where he’s on the cemetery committee and counts the weekend collection. He’s not a cradle Catholic, though. “I was nothing,” he said. His father died when he was freshman in high school, and his mother passed away from cancer during his senior year. He had no faith tradition until he met Dorothy, who was also a teacher. “You’ve got to take the Church along with me, she said when I proposed,” Brown recollected.